In a stately manner destroying the wickedness of the enemy. Who gained the eternal Kingdom. On 23 June 1821 a Synod took place at the Metropolis of Crete, in the Church of Saint Menas, where the Bishop of Crete began to read a letter sent from the vizier. The hostile enemies then rushed into the church and murdered the Hierarchs, seventeen Priests and five Athonite fathers from Vatopaidi Monastery, who presented in the Great Castle holy relics and the Holy Belt of the Theotokos during the plague epidemic. They also killed three hundred Christians who were in attendance. 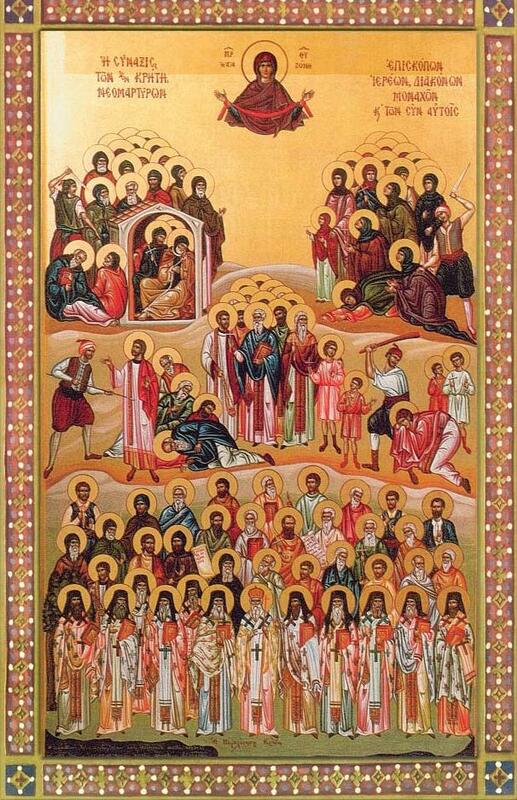 From there, they dispersed into the city, and they mercilessly killed any Christian they encountered on the street, and there they also encountered Bishop Hierotheos of Lampis, who they killed along with his deacon. The next day, in the village of Epano Fourni, where the Diocese of Petra was located, they shot with a rifle Bishop Joachim outside the Church of the Most Holy Theotokos. The names of the Bishops we celebrate today are: Gerasimos of Crete, Neophytos of Knossos, Joachim of Chersonisos, Hierotheos of Lampis, Zacharias of Sitia, Joachim of Petra, Gerasimos of Rethymnos, Kallinikos of Kydonia, Melchizedek of Kisamos, Kallinikos of Diopolis. The first celebration of this feast of All Clergy and Laity Martyred in Crete in 1821 and 1822 took place on 11 November 2000 in the Cathedral of Saint Menas in Heraklion. The much-wondrous, Crete let us honor, having blossomed forth, as honorable flowers, the Neomartyrs of Christ, divine rhetors of the faithful; they put error to shame, as divinely-minded shepherds, making firm the faithful, in the Orthodox faith, Gerasimos the president of Crete, and all those martyred with him. The famed fellow-martyrs, as an offering to You O Lord, the allotment of Crete offered, in these latter years. Through their entreaties, keep in deep peace, Your Church, through the Theotokos, Most Merciful One. Let us praise O faithful, the divine Bishops, Priests and Monastics, and all those with them, the faithful and individuals, who in these latter years, made the faith clear.